Game Center games are starting to pour in, and today I stumbled onto the (true**) first Match-3 game I’d seen, (although I don’t think it was the first one on there), called GeoBlocks. 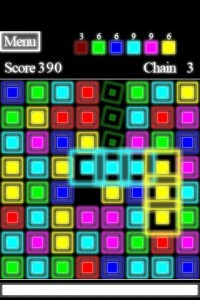 I’m going to talk about that, and then I’ll also talk about the second match-3 game I played with Game Center integration, Squaree, and I will actually go so far as to say that Squaree is my new favorite Match-3 game! As of this writing, both GeoBlocks and Squaree are FREE in the app store, so get ’em while they’re hot. I played GeoBlocks for quite a while, trying to get the next achievement. It’s a pretty standard match-3, with level progression based on the number of matches you’ve gotten in all the colors. In fact, that’s one of the only really interesting aspects of the game… to score really big, you actually want to try NOT to progress, so you can rack up points before the timer (white line at the bottom of the screen) gets going so fast that you don’t have time to think before you match. I made a note to myself to add GeoBlocks to my spreadsheet listing Match-3 games for the iPhone, and I actually went one step further than that, and added a column indicating whether the game has Game Center integration. I suppose now that I’ve done that, I should really add another column for OpenFeint. Maybe I’ll do that some other time and actually go through all the games listed to see which have which features. So then I went looking to see if there were other Match-3 games with Game Center, and I found Jewel Craft in the featured list. I wasn’t about to shell out $3 for another Match-3 game though, (especially when I just played a perfectly decent one for free). That got me thinking about what other free Game Center games there might be out there, so I searched App Shopper for “game center”, and sorted by price. That was when I found Squaree. Squaree doesn’t really look like much, and (as is common when I go app shopping) at first I didn’t even play it, just downloaded it to check out later. But I soon grew tired of scanning through all the crap in that AppShopper search, and Squaree was either the first or second app I opened up to check out. It’s match-3, definitely, but the way you get your squares is pretty unique. There is a board with a whole bunch of grayed out pieces. Tapping a piece causes un-gray, and for it to fall all the way to the bottom of the board (or until it hits another solid piece). Get three of the same color to match, and two of them disappear, but the third turns into a “locked” piece. Match four pieces and you get a X2 piece remaining, and if you match 5, you get a piece that, when matched, removes all solid pieces of that color from the gameboard. **Note that both Azkend and Dice Match had Game Center the day after its launch. 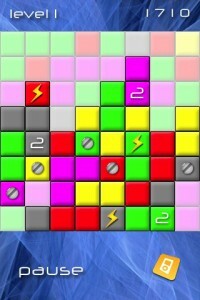 They are both solidly in the Match-3 category, but neither has the swap-to-remove mechanic. Both are the kind where the matches already exist and you have to choose which one to remove. (Think Same Game rather than Bejeweled, but you have to touch all the pieces you want to remove.) It would be interesting to write another post comparing and contrasting those two games, but I’m pretty much done for the evening. Today marks the re-launch of Chesstris.com. I had a bit of a revelation in the car the other day, and realized that both the video games I’ve designed and actually completed are hybrid video games mashed-up with board games. This is a mixture that I wholeheartedly endorse and enjoy, and it’s one that I realized that the name “Chesstris” could also be imagined to embody. Anyway, it’s what I will now endeavor to spend more time examining here. Chesstris, where board games and video games collide. 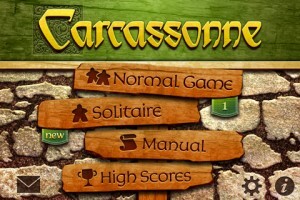 To kick off this new era for the site, I thought I’d start with a review of one of the most worthy board games I’ve seen converted to a video game for the iPhone, Carcassonne. Sure, the Carcassonne app, for iOS has only been around since the beginning of June, but we’ve actually been playing Carcassonne the board game for years in my house. Literally, I’ve been playing Carcassonne longer than I’ve known my wife Florence, which, while it hasn’t actually been that long, feels like pretty much forever. (Not in a bad way, I swear!) I have a bunch of the expansions, and I keep them all together in the special edition wooden box that came with Carcassonne, The City. (The City is actually a stand-alone game, with pieces that are incompatible with the original game. This is the number one reason it is relegated to the closet while we keep the standard game and all its compatible expansions in the living room with the “often played” games.) 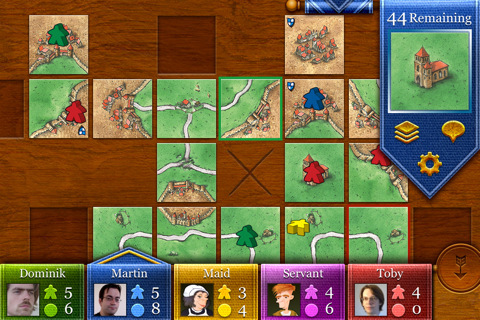 Anyway, I bought Carcassonne for the iPhone as soon as I heard it was out, and straight away convinced Florence and our friend Angela to play a game with me on the iPad. 1) They implemented pretty much every kind of multiplayer possible. Pass-and-play on the same device, multi-device on Wifi or bluetooth local networks, internet play with no time limit, and internet play with 60 seconds per turn. There is an invitation system for playing against friends who also have the app, or you can play against random opponents. 2) They built in 6 or 8 different kinds of AI (I forget which), for playing local games on the device. 4) Push notifications let you know when it’s your turn to play. This has since become a feature requirement if I make a turn-based iPhone app in the future. 5) This feature, while it may not sound like much, is one of those little details that makes a game feel incredibly highly polished. They could easily have left this out, but I feel certain this was one of those features that someone really felt they had to get in there, and it really adds a lot, in my opinion: On the screen that lists your in-progress games, there is a thumbnail representing the shape of the tiles for that game. This basically “personalizes” each game, and makes the list of games you’re playing feel that much more unique. I’m sure there are more features I’m forgetting, but it’s worth mentioning that the game play screen itself is just an amazing piece of touch-based software engineering. It’s got all the standard pinch-and-zoom stuff, and for all the information it’s cramming onto the screen, doesn’t feel cluttered or busy at all. With no limit that I’ve seen on the number of games you can play, we’ve got about six friends and every permutation of games going. I have a game with Florence and Angela, along with a game with just Angela, and one with just Florence. Then there’s a game with Florence and Angela and Mike, along with a game with just Mike, and of course a game with Mike, Angela, and me, and Mike, Florence and me. You get the idea. I’ll spare you my spelling-out how this scales to include Nate, Roo and Sebastian. Overall, I have gotten so much more than $5 worth of pleasure out of this app that it’s not even funny. I play Carcassonne on my iPhone as much as, and sometimes more than, I use the Mail app (which I do daily, btw). 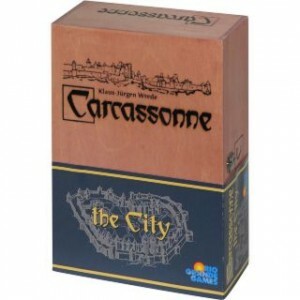 Carcassonne is not really a hybrid board game / video game, but it’s such a great conversion of one to the other that it’s definitely worth reviewing here. We really enjoy it a lot, and hope you do too!